An art demonstration using three mechanically controlled human heads to sing could be the scariest thing we've seen all year. 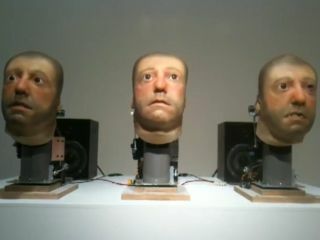 Set up as part of an art installation in Switzerland, the $75,000 (£45,000) these animatronic heads will serenade anyone that cares to watch them. Controlled by a computer to make the singing seem realistic and synchronised with the music, that doesn't stop us reaching for the holy water. For the love of all that is good and pure! We know we're supposed to love technology, but when it has rolling eyes, mouths that you can see through and, for some reason, a desire to sing in a scary high pitched voice, we want to kill it. Kill it dead. If you want to see them in action (and let's face it, you know you do despite what we've just said) check out the video. Then sleep with the light on.